What are Company’s Strategic Assets? 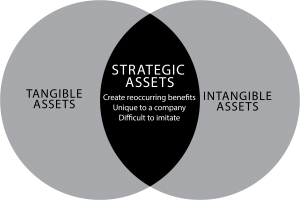 Company’s Strategic Assets sit at the intersection of tangible and intangible assets and create recurring benefits, are unique, and difficult to imitate. Such strategic assets can include intellectual property, customer relationships, proprietary business processes and algorithms, novel revenue streams, and brand value. Why focus on Company’s Strategic Assets? The definition of Strategic Assets is related to the accounting term goodwill, which is an intangible asset that results from the acquisition of a company at a premium value. The premium is the amount an acquiring company pays for a target company in excess of the target company’s book value. Strategic assets have historically been difficult to quantify, but are known to make a company more valuable. Corporate buyers have been placing increased emphasis and value on strategic assets compared to tangible assets, like property, equipment, and manufacturing facilities. Corporate resources applied to build a robust set of company’s strategic assets are increasingly providing a higher return on investment than those focused strictly on earnings growth. High profile transactions such as Facebook’s acquisition of WhatsApp, AT&T’s purchase of DirecTV, and Campari’s acquisition of Wild Turkey all demonstrated the high percentage of purchase price allotted to goodwill due to the seller’s strong set of strategic assets. There is currently more than $2.5 trillion in goodwill on corporations’ balance sheets (Source: TIME magazine). Why? As corporate awareness of intangible asset value is increasing, fewer companies are pursuing acquisitions to add production facilities and other tangible assets. For example, when Microsoft bought LinkedIn, it was for almost exclusively for their intangible and strategic assets, such as its brand, website platform, user/customer data, and perhaps the management team and their connections (e.g., Reid Hoffman!). How to determine which Company’s Strategic Assets to pursue? Over the past few months, Gates and Company, in conjunction with Jahani & Associates, have been working to determine if the strategic assets that help companies achieve premium valuations can be identified and developed. Knowing that the concept of strategic assets would not benefit every business, and would certainly vary sector-by-sector, the team began by reviewing M&A deals in the tech sector. Over 500 transactions that closed between 2010 and 2016 were analyzed to determine strategic asset characteristics and goodwill drivers. In each of these examples, the target company’s strategic assets (IP, customer relationships, brand, etc.) were valued significantly higher than their tangible/physical assets (plants, property, equipment, etc.). Results from the tech sector analysis indicated that companies with recognizable strengths in social media, web advertising, and data analytics consistently received valuations above market. Additionally, an active user/subscriber base was a driver in over 60% of the acquisitions. Corporate leaders, business owners, and investors face a critical issue: in order to maximize value they must enhance the set of strategic assets in their company and/or portfolio of businesses. Thorough analysis of transactional data to identify strategic asset characteristics and goodwill drivers must be considered in conjunction with corporate core competencies, market dynamics, and economic trends to build out the most relevant value-enhancing strategic assets. With offices near Philadelphia and Munich, Germany, Gates and Company is an investment banking and management consulting firm dedicated to helping companies grow. With an impressive track record of helping numerous companies reach their goals, Gates and Company specializes in M&A, market research/analysis, growth strategy formulation, business plan development, product/venture launch, and financial advisory services. Gates and Company’s Management Consulting team has invested significant time and resources to refine and validate its methodology of determining strategic asset characteristics and goodwill drivers in the tech sector. Current efforts are underway in the Health IT sector. By reviewing market dynamics and hundreds of M&A deals on a sector-by-sector basis, Gates and Company offer these insights to its clients so they can better understand how to identify and develop an optimized set of strategic assets. Gates and Company’s Investment Banking team helps companies seeking liquidity with comprehensive M&A services to sell businesses or business units, including identifying and assessing those potential buyers most likely to be attracted to a company’s current and developing set of strategic assets. For more information about Gates and Company, visit www.GatesAndCompany.com. David Gates has many years of senior management, strategic/tactical planning, operations, and business development experience in entrepreneurial and corporate environments. Mr. Gates spearheaded early-stage operations and turned around organizations facing significant competitive and financial challenges. After eight years of increasing responsibility in a variety of business units within the DuPont Company, Mr. Gates acquired, grew, and sold an early-stage technology company. He was then Executive Vice President at a middle-market electronics technology firm. In 1999, Mr. Gates founded Gates and Company. 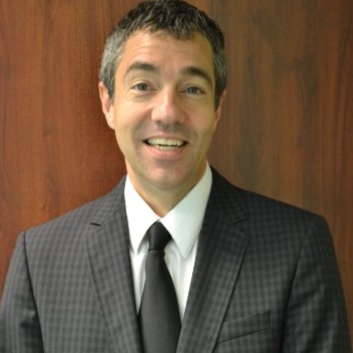 He was co-founder of Diamond State Ventures (now Mid-Atlantic Diamond Ventures); was previously on the Advisory Board for Junior Achievement of Delaware and on the Board of the Delaware Symphony Orchestra. He holds his MBA from Wharton and resides in Delaware.